On Monday, Feb. 22, the Bureau of Engraving and Printing (BEP) started taking orders for uncut currency sheets of Series 2013 $2 notes. Designated for the Federal Reserve Bank of Dallas, they bear the signatures of Secretary of the Treasury Jacob Lew and Treasurer of the United States Rosie Rios. These currency sheets join earlier and still available sheets of Series 2009 $2 notes designated for Boston with signatures of Rios and former U.S. Treasury Secretary Timothy Geithner. 32 subject sheet (Dallas) for $102.00. Each of these products has respective premiums of $14.50, $20, $29 and $38. Both the older Series 2009 and newer Series 2013 $2 Uncut Currency Sheets are available from the BEP website at www.moneyfactorystore.gov/uncutcurrency.aspx. 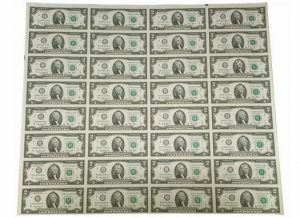 The Bureau of Engraving and Printing also offers 16 and 32 subject acrylic frames to hold, view and hang currency sheets. Their prices are $40 and $60. The BEP is the largest producer of security documents in the United States. 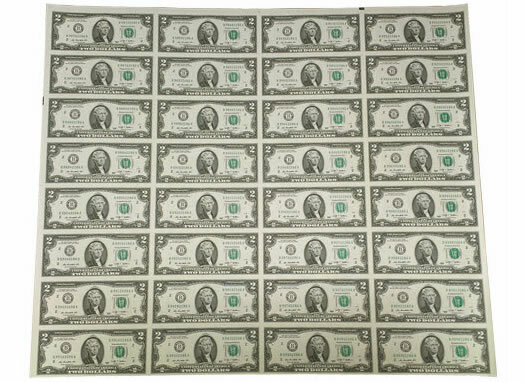 It prints billions of Federal Reserve Notes each year for delivery to the Federal Reserve System. It also produces products for collectors to include intaglio prints, vignettes, and presidential portraits. The BEP still has some products going back to at least 2009 available for purchase. There is s section in the left-hand side under the heading “Categories” for sold out items as a reference for collectors who missed out on products but still want to research the product information so they can purchase them on the secondary market from paper money dealers. Just FYI.